If Los Angeles wins its bid for the 2024 Olympics, UCLA will house the athletes. Mayor Eric Garcetti announced on Monday that the campus is slated serve as the Olympic Village, the same role it served when the city last hosted the Summer Games in 1984. Preexisting facilities at USC, CSULA and UCSB were also used, which contributed to the event producing a $232.5 million surplus. UCLA will build an additional 2,000 beds that will be used in the Olympic Village. They'll also get "rent" money from Olympics. Los Angeles is competing with Rome, Paris and Budapest to host the 2024 games, with the International Olympic Committee set to make a decision next year. 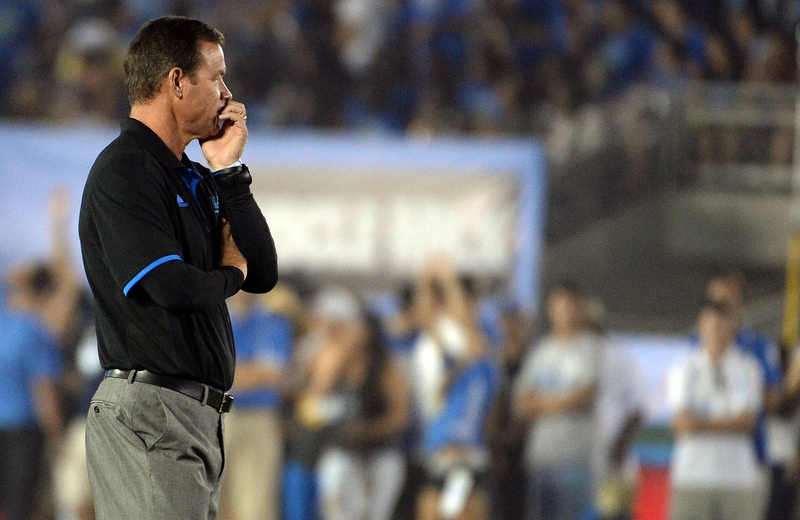 UCLA coach Jim Mora prior to the Bruins’ game against Utah at the Rose Bowl on Oct. 4, 2014. For all your tailgating planning purposes, UCLA’s nonconference schedule is now fully set with kickoff times. The Bruins will open their season on Sept. 5 at the Rose Bowl with a 12:30 p.m. kickoff against Virginia, which they will then follow with a pair of 7:30 p.m. starts at UNLV (previously announced) and against BYU. UCLA’s Thursday games at Stanford and at home against Cal in October are also set for 7:30 p.m. and 6 p.m. kickoffs, respectively. UCLA is No. 22 in the first-ever College Football Playoff rankings, which were announced Tuesday evening on ESPN. The Bruins were popularly touted as a playoff contender before the season started, but have since lost games to Utah and Oregon — as well as struggling to piece together complete games in most of their wins. The best that UCLA can now hope for is likely a Pac-12 South championship, which should give them another shot at the Ducks in the conference title game. These are the first of six weekly top-25 rankings that will be announced leading up to the inaugural four-team playoff, which replaced the former BCS Championship system. The Pac-12’s other representatives are No. 12 Arizona — the Bruins’ next opponent — No. 14 Arizona State, and No. 17 Utah. UCLA No. 25 in the Associated Press poll, but committee members are told to disregard polls that set preseason rankings when making their own decisions. UCLA hasn’t put together a complete game since a blowout win at Arizona State last month. Today’s 11 a.m. PT kickoff at Colorado — arguably the worst team in the Pac-12 — gives the Bruins their best chance to do so again before a their schedule heats up. UCLA offense vs. Colorado defense: Brett Hundley is going to leave UCLA as one of its best quarterbacks ever. This has been clear for so long now that little he’s done this season has raised any eyebrows. He only needs two more touchdown passes to tie the school’s all-time record of 68, set by Cade McNown from 1995-98. He is 2,371 yards behind McNown’s all-time record for passing yards (10,708), though he’s on pace to finish about 200 yards short. He has eclipsed 300 passing yards eight times in his career, doing it three times this season; three more will tie McNown’s mark too. Oregon and UCLA are both overwhelming favorites in their respective divisions, but for the fourth time in five years, the Ducks are the preseason pick to win the Pac-12. Media members gave Oregon 24 votes to win conference title game at Levi’s Stadium on Dec. 5, nearly double the 13 votes UCLA received. Stanford and USC also received one vote each to win the league, though they only combined for three votes to take their respective divisions.